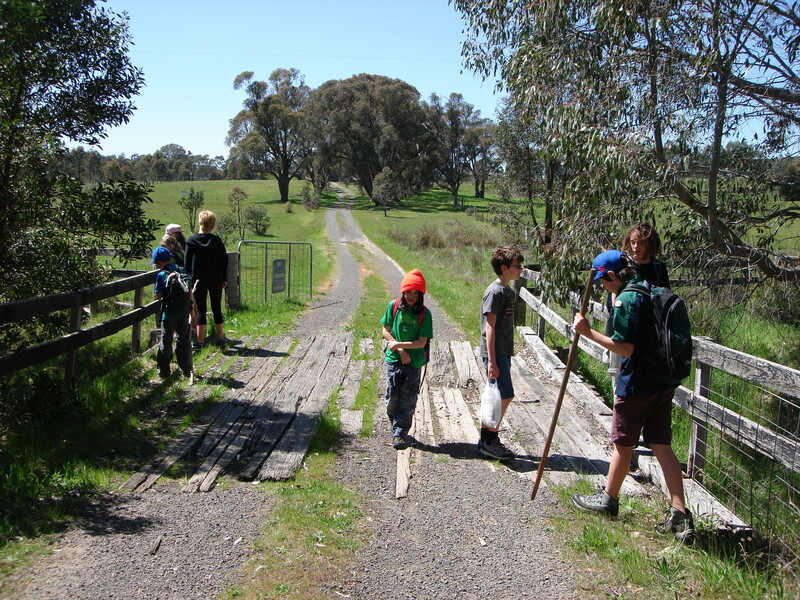 Representatives of 6th Melbourne turned out to march from the local RSL to the cenotaph on Racecourse Road behind a lone piper. 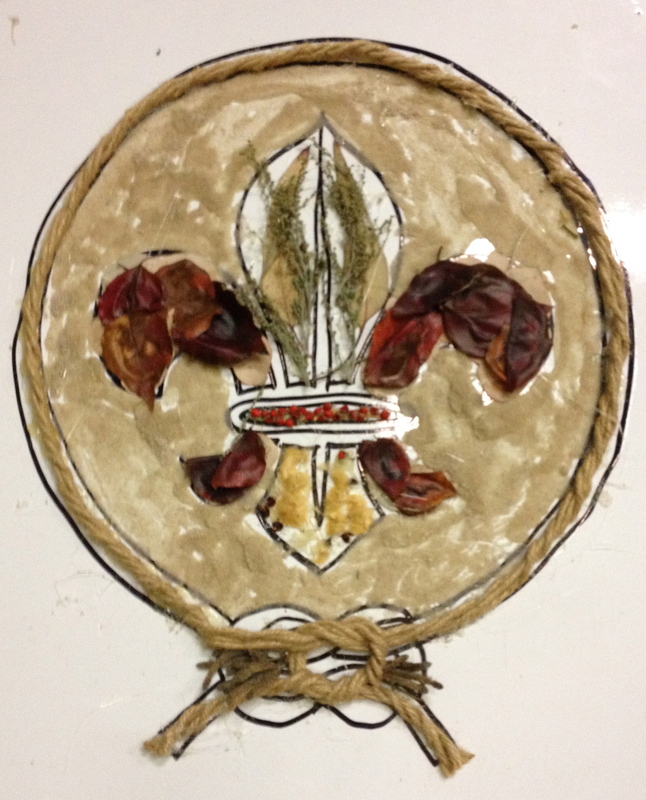 The weather was a little wet but spirits were still high as a hand made wreath consisting of several poppies made by our scouts was laid on behalf of 6th Melbourne by Emma Rawson and Arcadia Merlot. 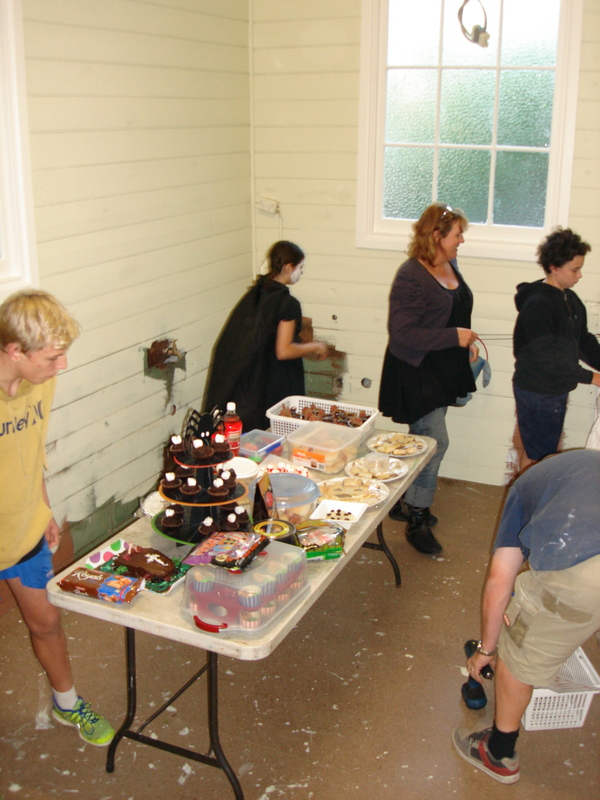 A hearty BBQ breakfast of bacon and egg rolls prepared by Richard, Dale, Elizabeth and Michael was enjoyed by all our marchers back at our hall. 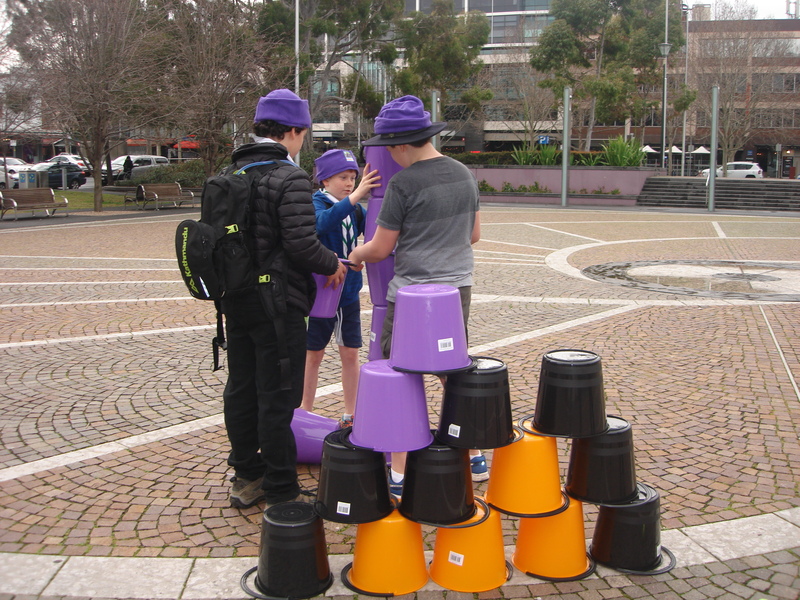 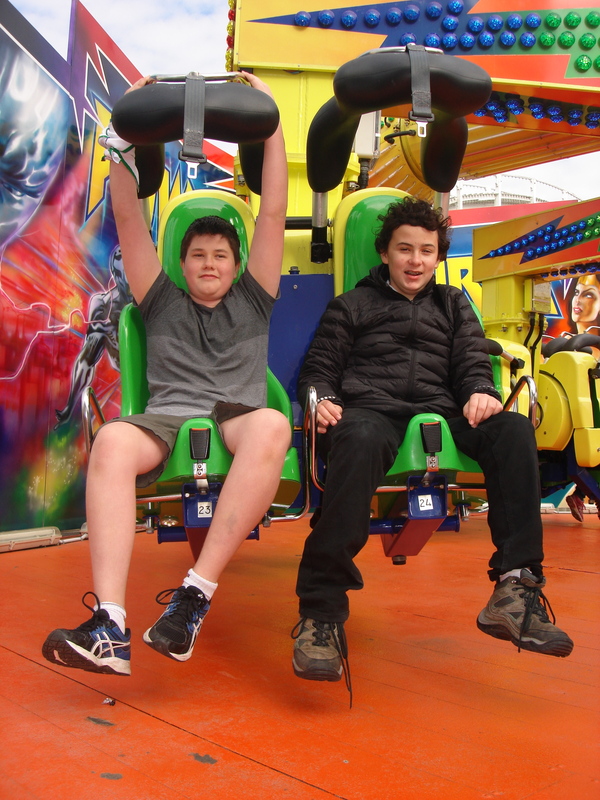 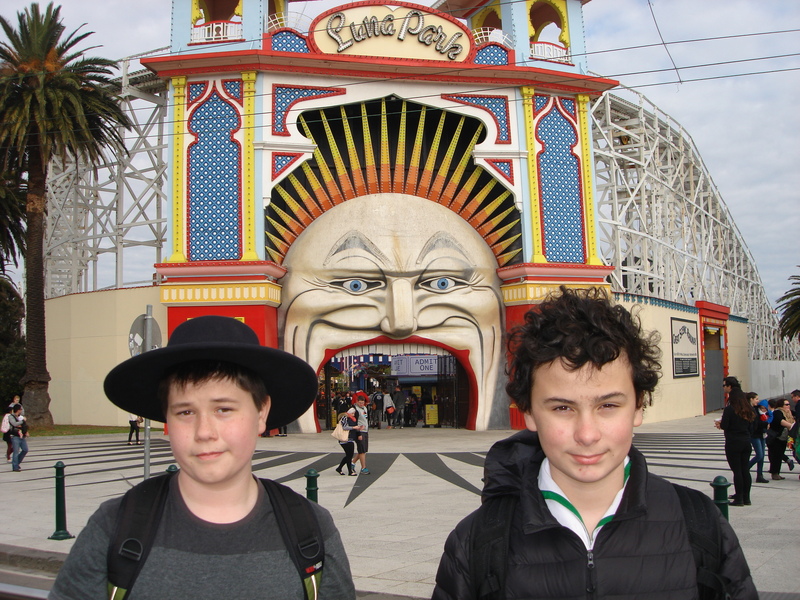 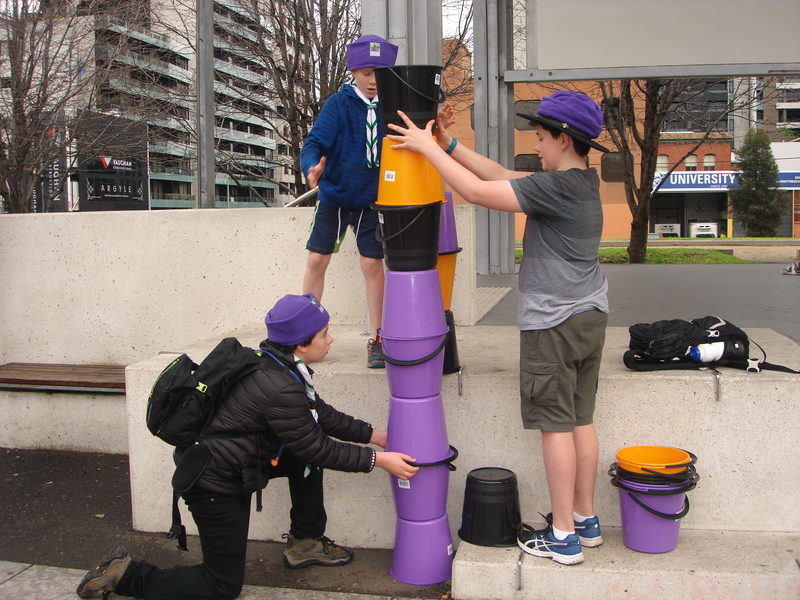 Based on the ‘Amazing Race’ TV show, the Fantastic race involves Scouts travelling in Patrols and completing a number of challenges in locations across Melbourne. 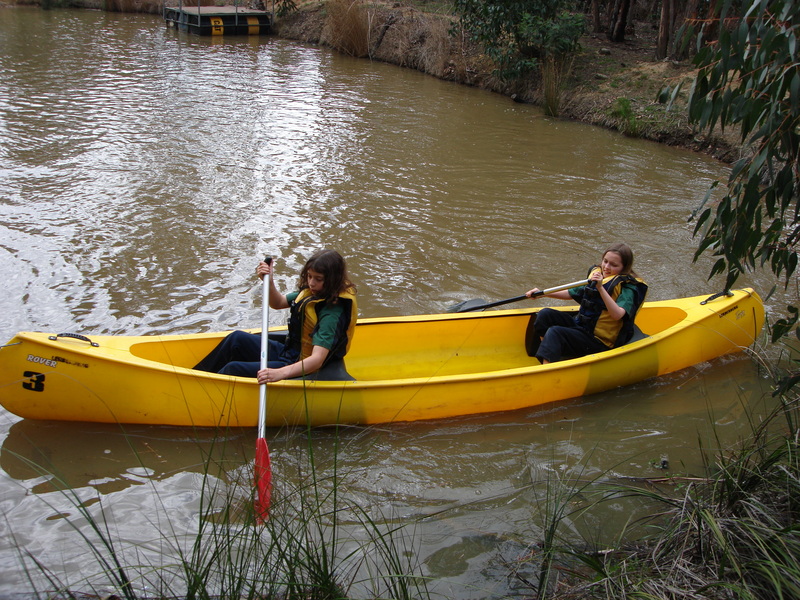 The Patrols follow clues to navigate between the locations. 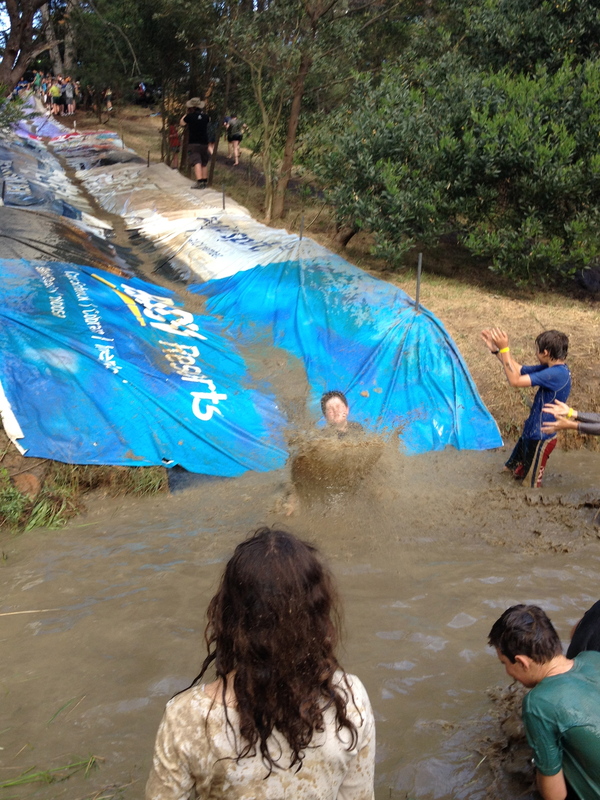 Each and every year the locations and challenges in the race change. 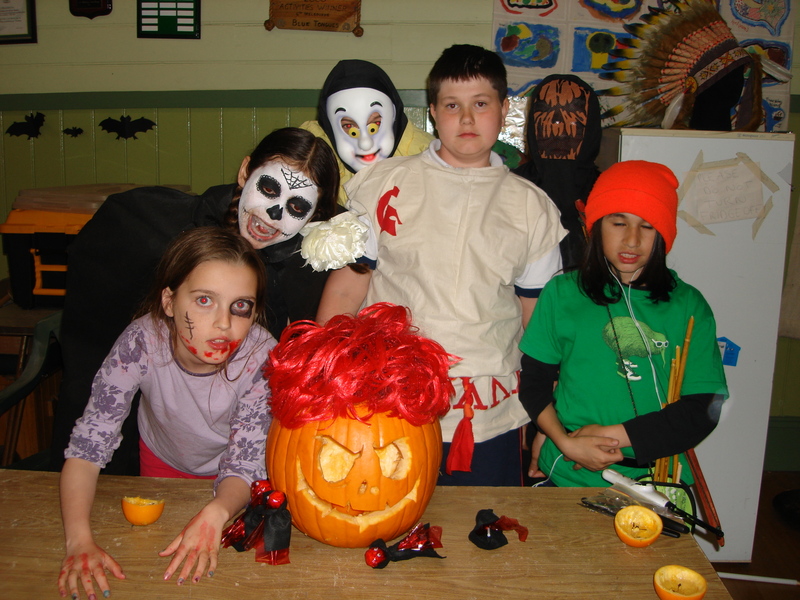 In fact no two races have ever been the same. 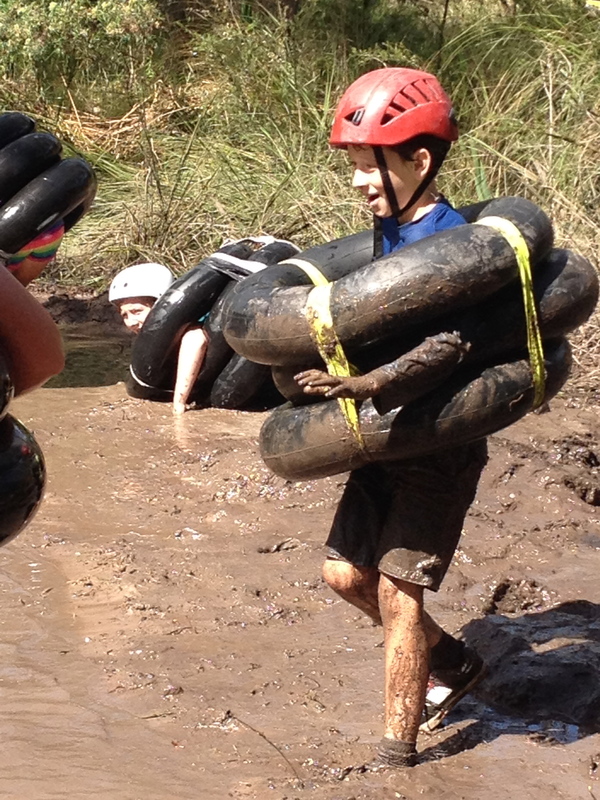 All the details are kept a very closely guarded secret right up until the race starts. 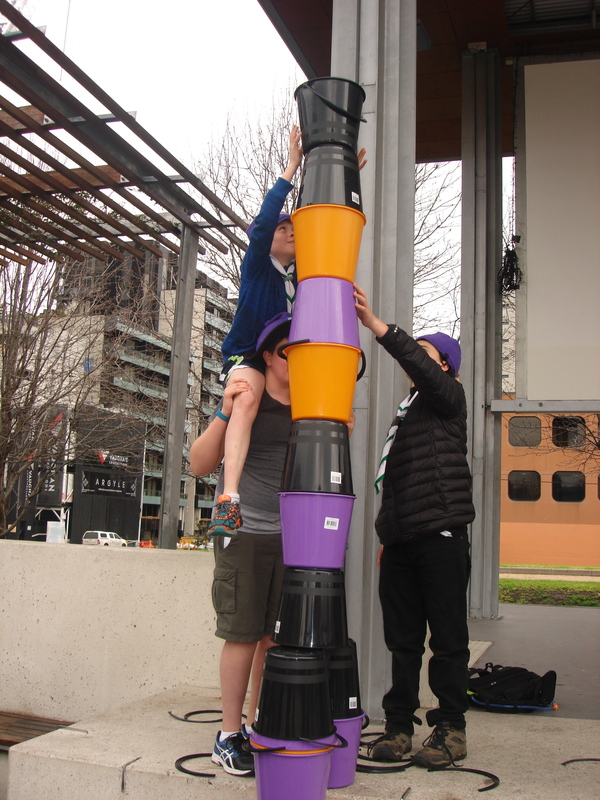 This year our small patrol of three from 6th Melbourne hunted clues from Albert Park, St Kilda, Carlton, Brunswick, the CBD and on Saturday night everyone came together at CRC Sydenham for a BBQ and Movie. 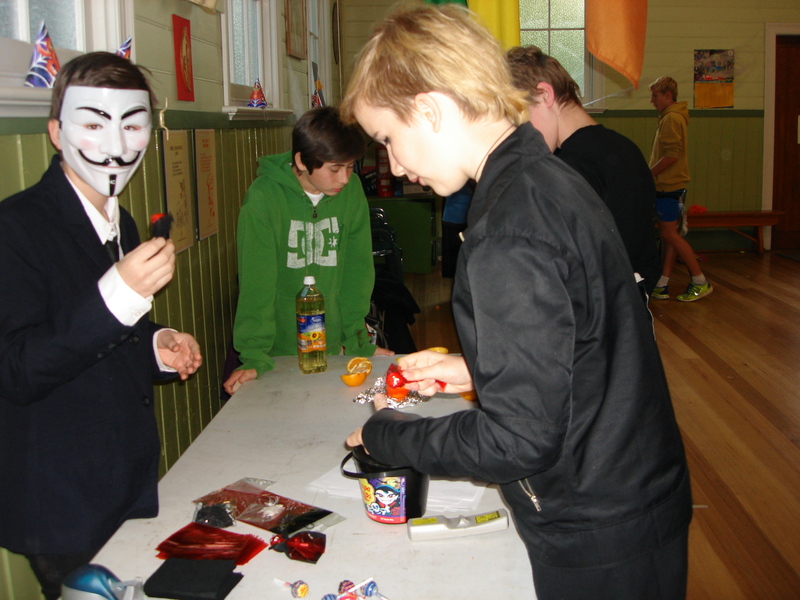 Sunday morning everyone participated together in a surprise activity which this year was Lunar Park. 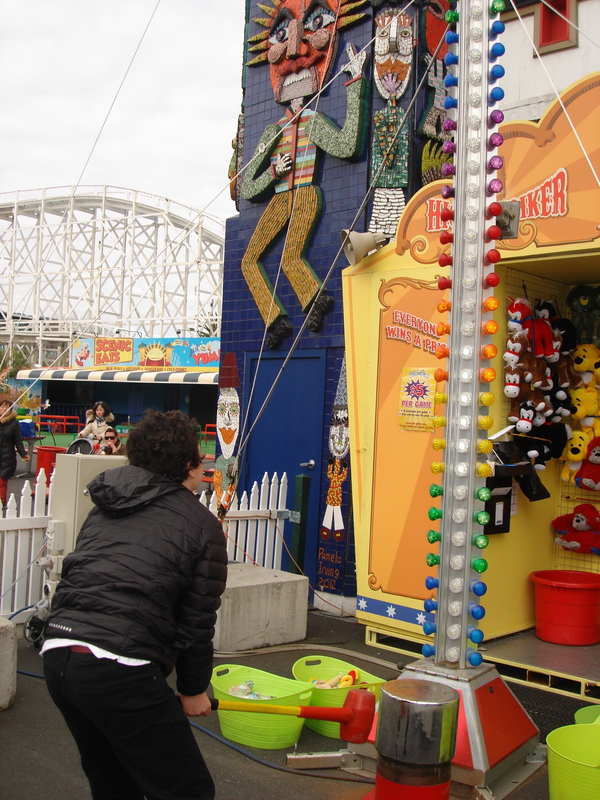 How strong are you Alex? 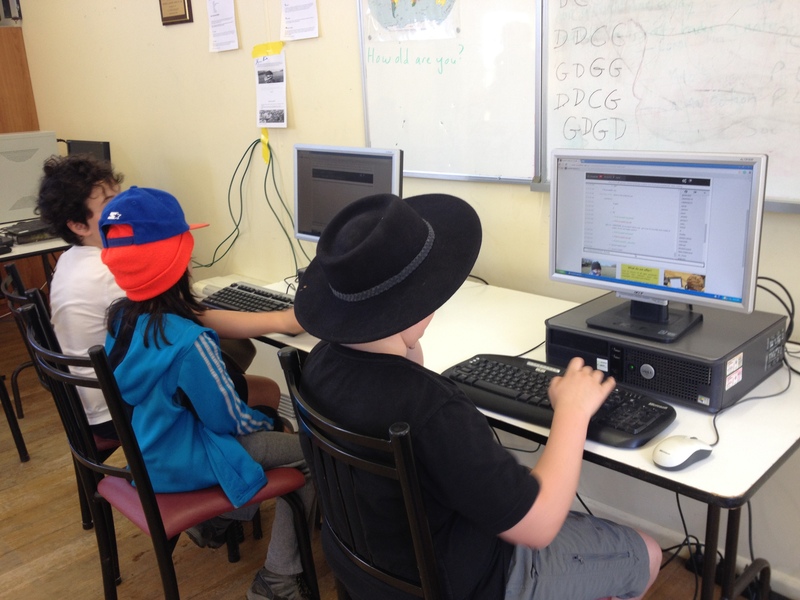 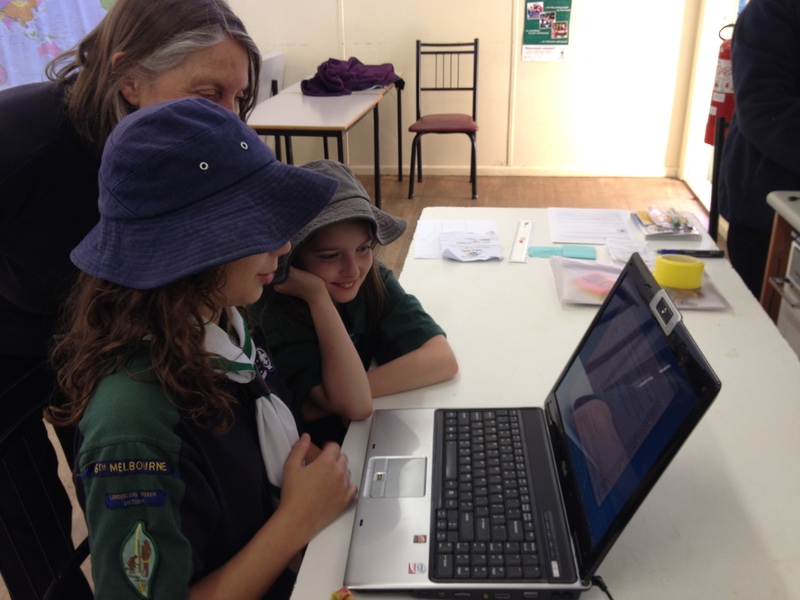 Last week our Scouts completed their World Scouting proficiency badge by researching and finding out facts about the history of Scouting history. 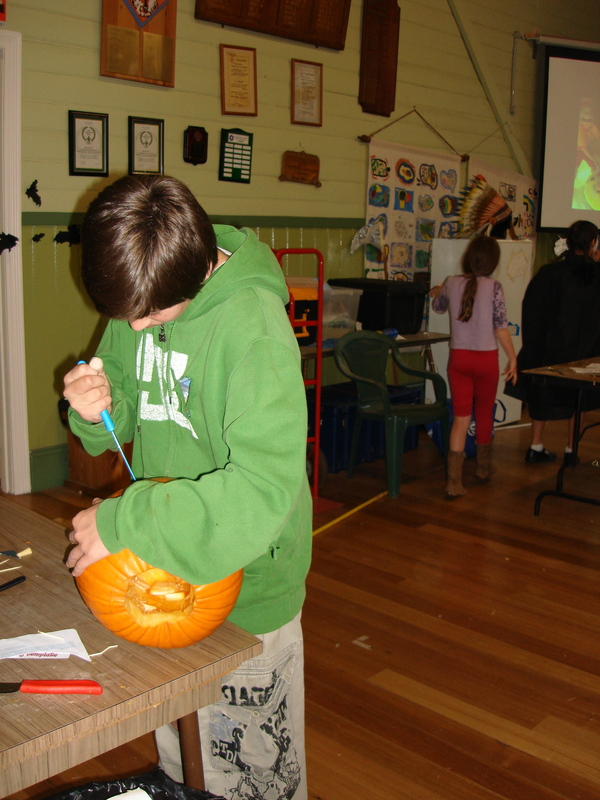 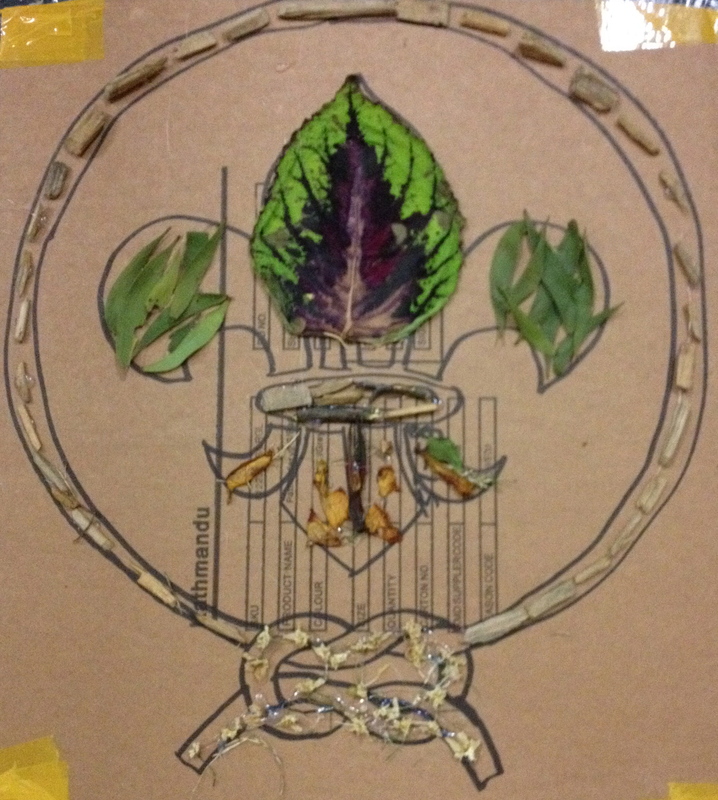 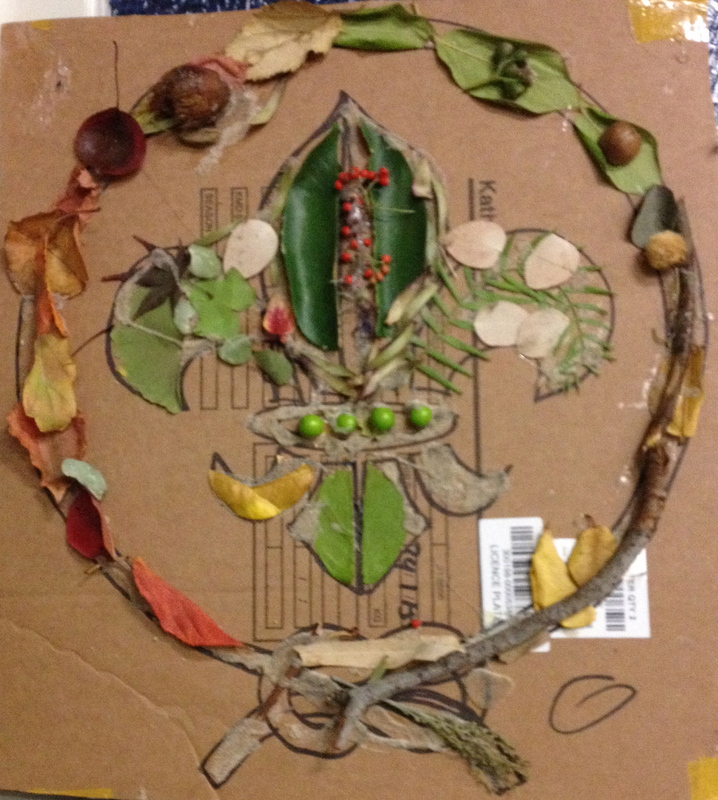 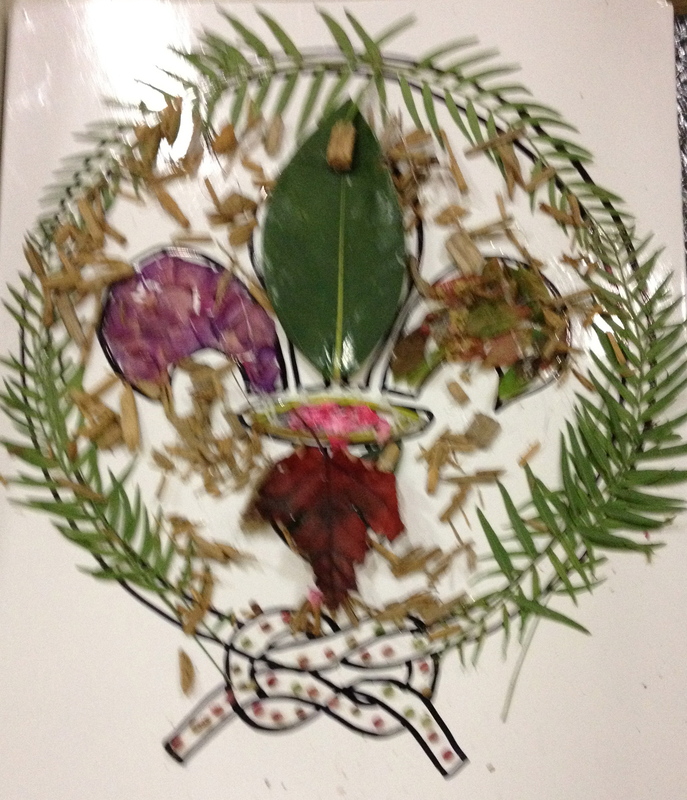 They also used natural materials to make models of the World Scout Badge which are displayed in the hall. 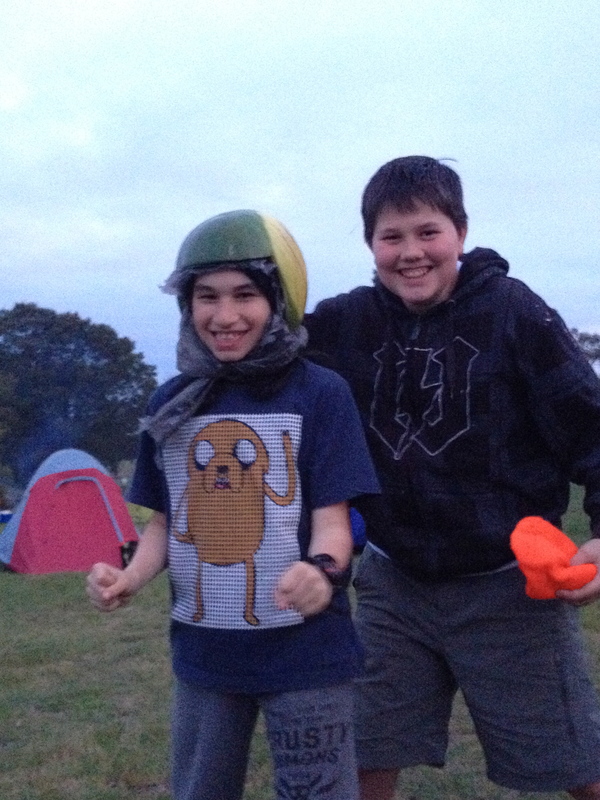 Twelve Scouts from 6th Melbourne enjoyed several fun and adventurous activities over the weekend including Mud Sumo Wrestling, Air Rifles, Canoeing, Archery, Giant Mud Slide, BMX Biking, Rocket Launchers, Abseiling, T Shirt Printing, Slot Cars, Volleyball, Challenge Valley, Pyrographics, Sock Wrestling, Clay Modelling, Movie and Disco to name but a few. 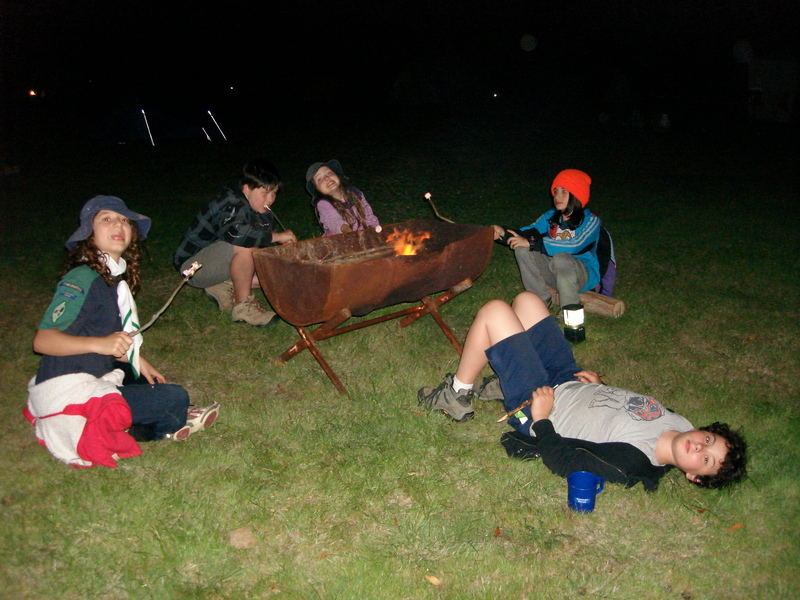 We had a very impressive camp site, having its own picnic table and fire pit as well as being close to the amenities, great for after the muddy activities. 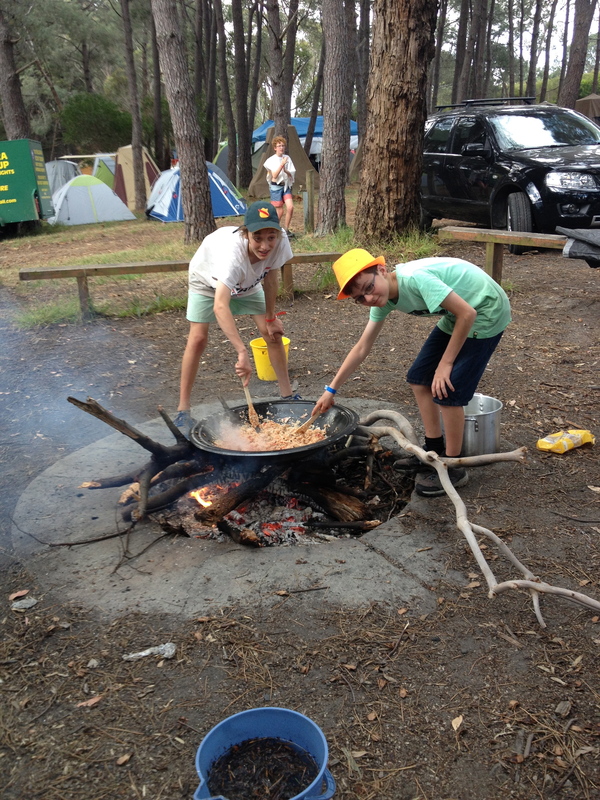 Our able bodied camp master and caterer, Craig Morton, cooked up a storm with the help of our Scouts making Paella in a makeshift pan over our open fire. 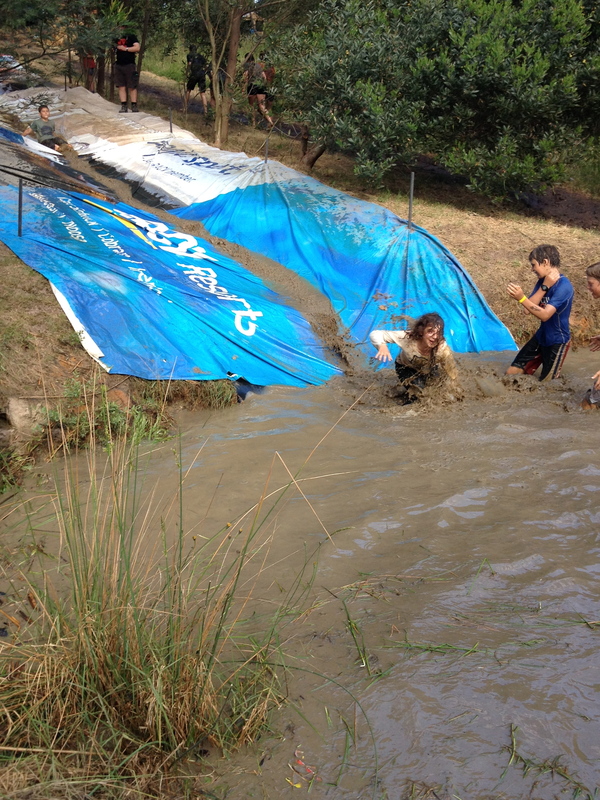 Everyone enjoyed it immensely but we just couldn’t get through the 2kgs of rice. 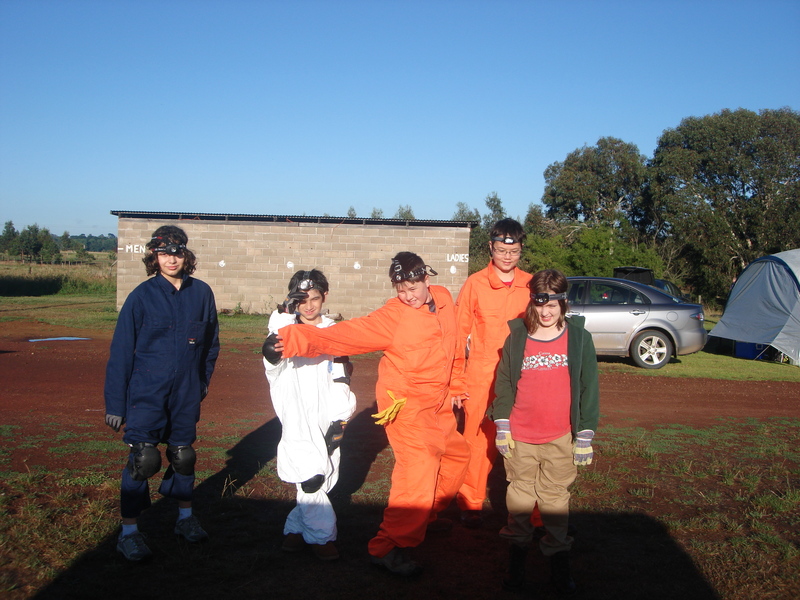 Congratulations to the Raging Rabbits patrol led by Alex Marum as patrol leader with Michael Davis, Kenneth Wong, Sofia Lambert and Lucy Churches on attaining a Silver pennant at the latest Cohen Shield camp. 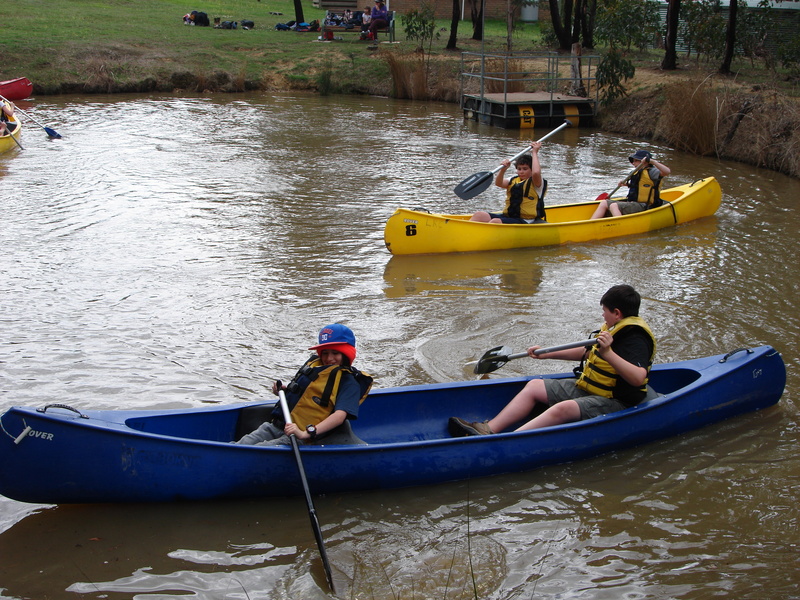 The patrols competed in navigation, cooking, first aid, Scout skills and construction to build their competition points as well as other activities like JOTI/JOTA, canoeing and crate stacking to keep them busy. 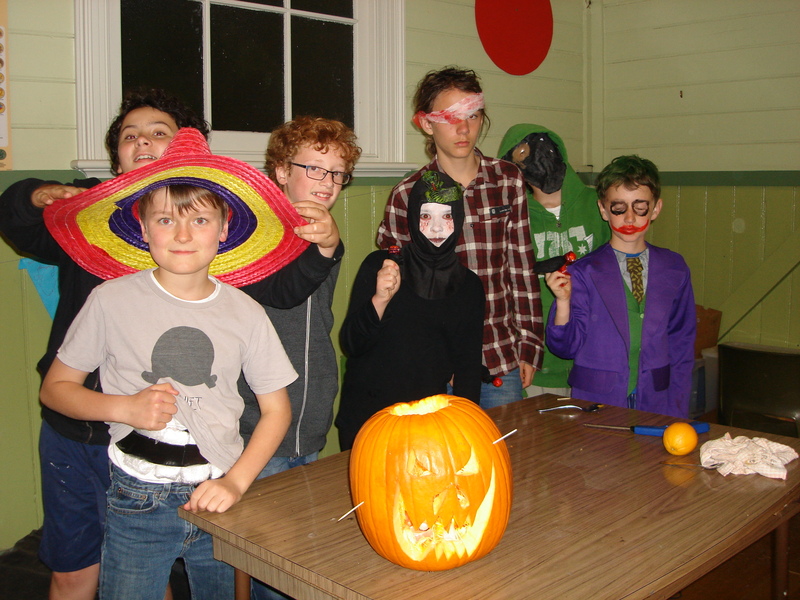 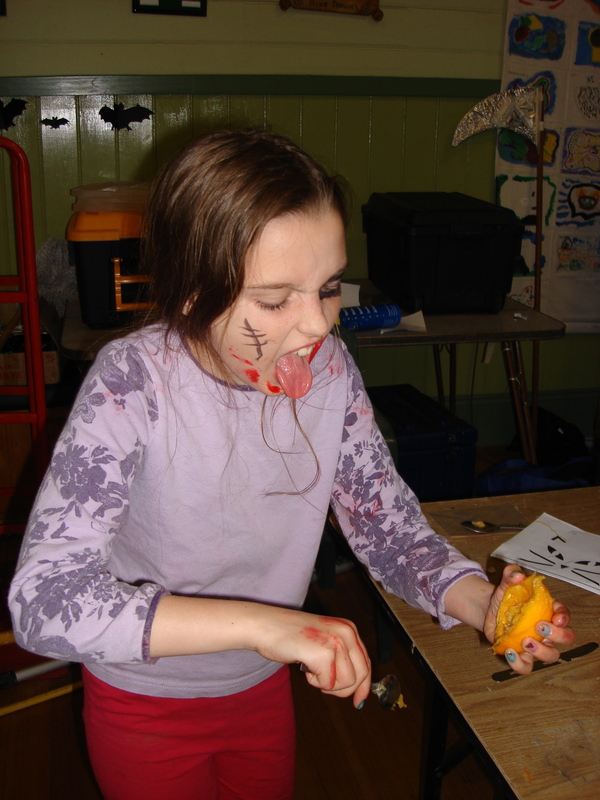 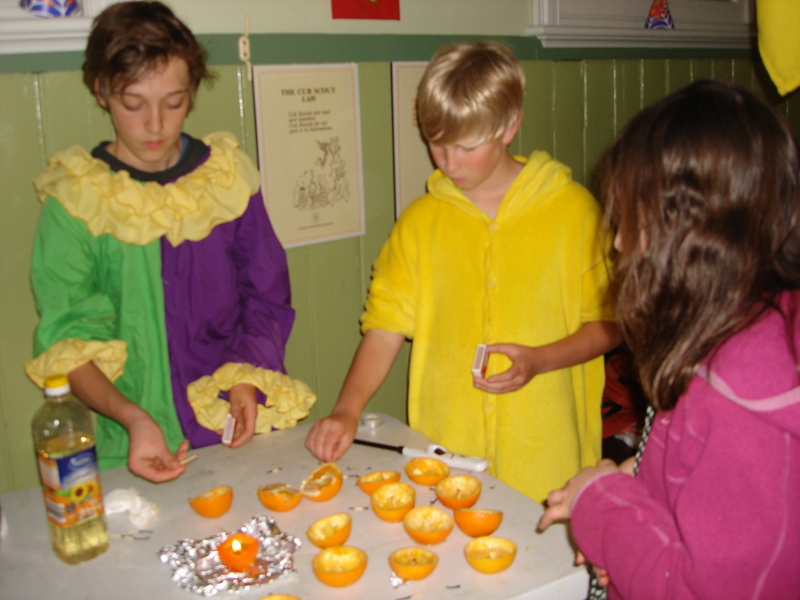 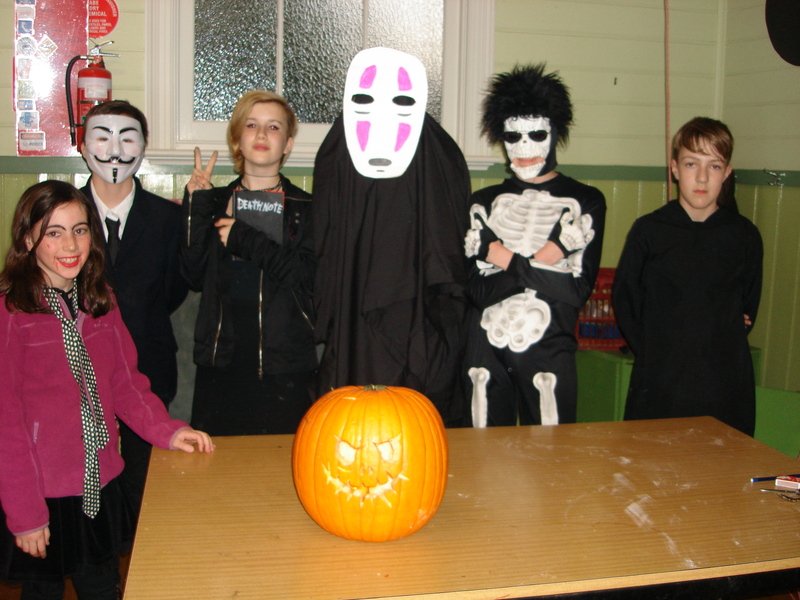 A night of Halloween preparation where 4 fantastic pumpkins were carved by an assortment of characters, orange tea light candles and Vampire lollipops made followed by a spooky evening supper. 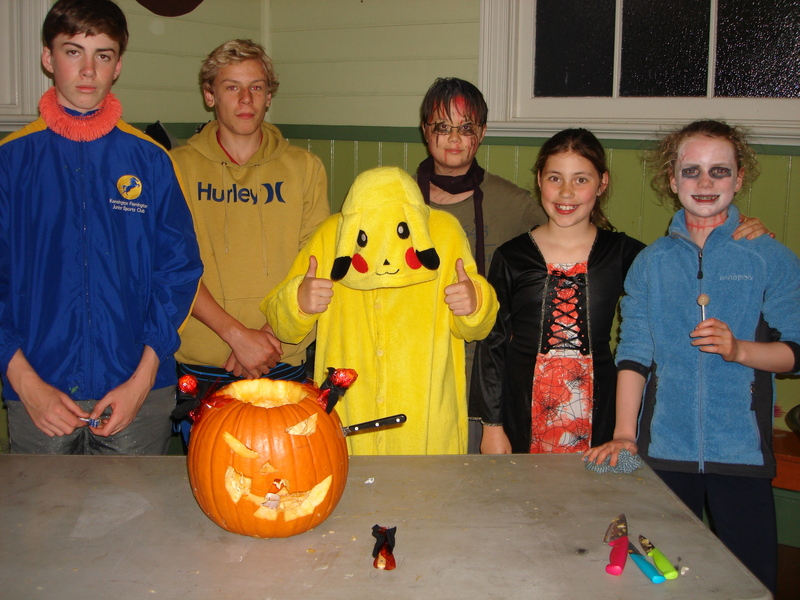 Fun packed night had by all. 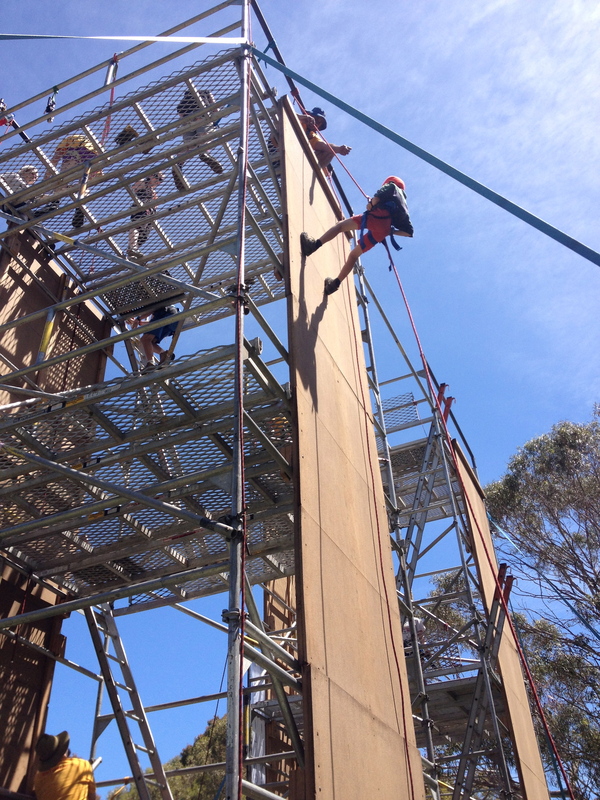 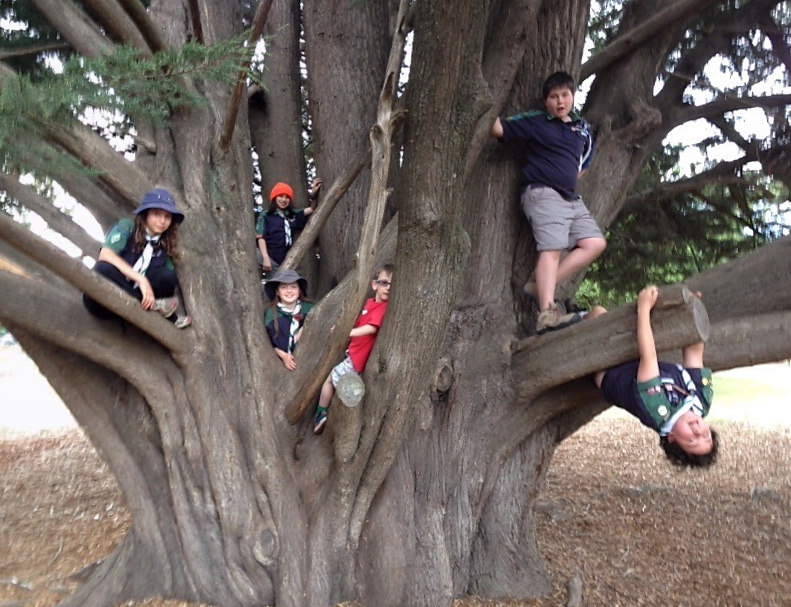 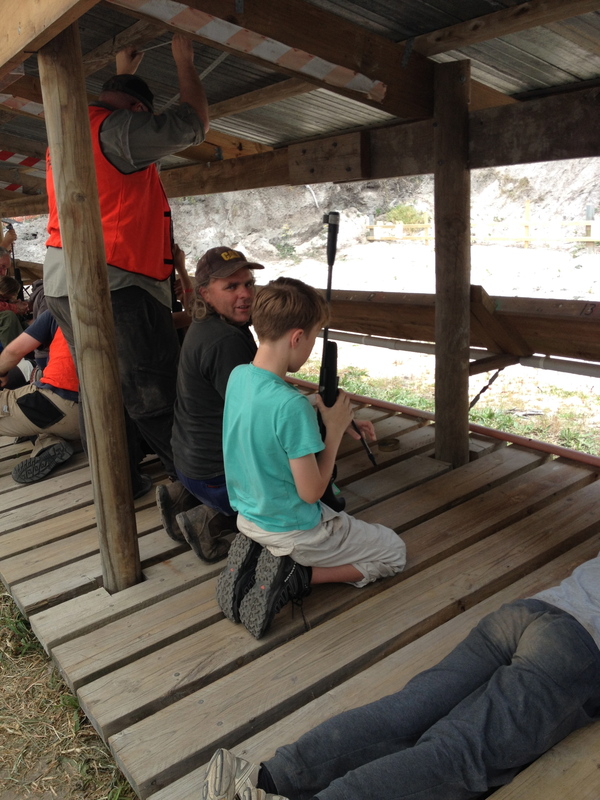 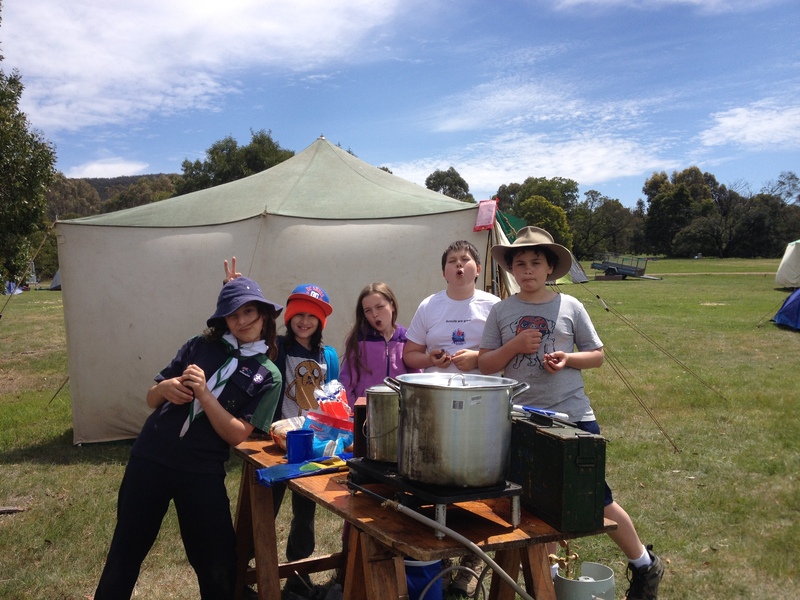 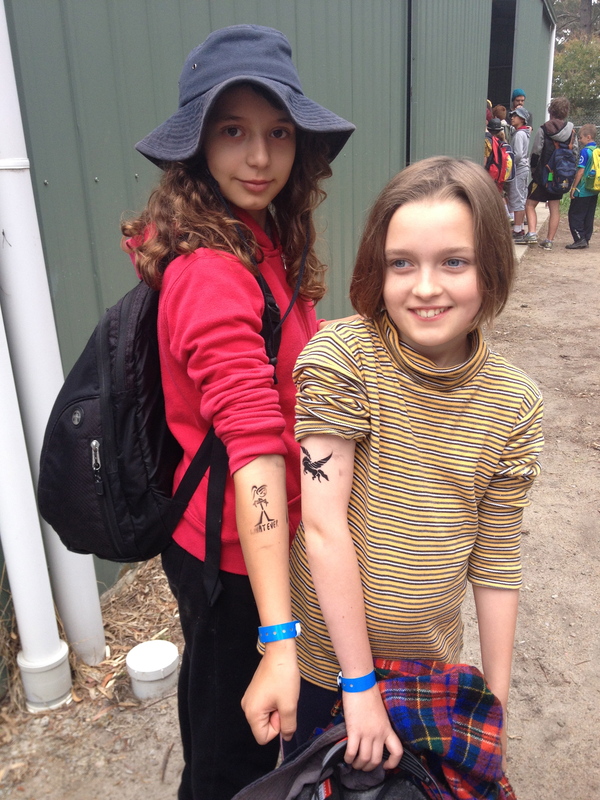 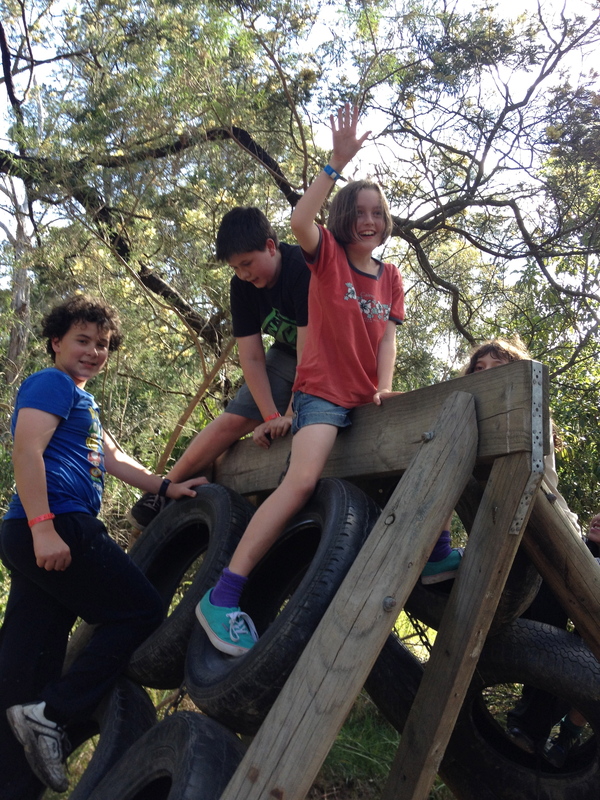 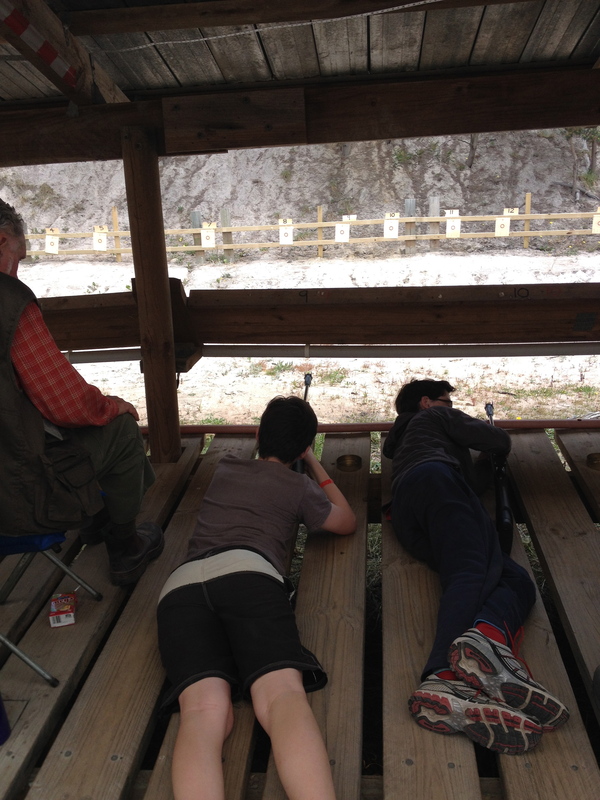 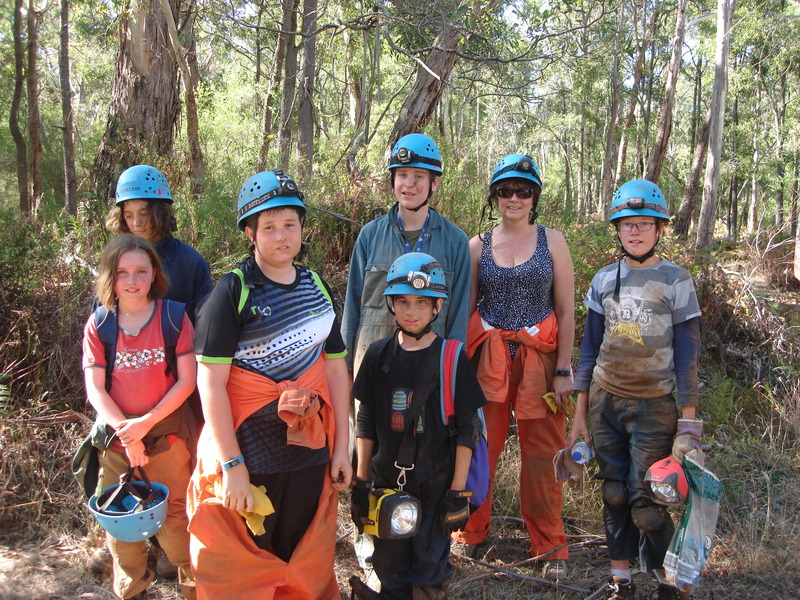 A great weekend was had by ten of our Scouts at Noonameena Scout camp in Lauriston. 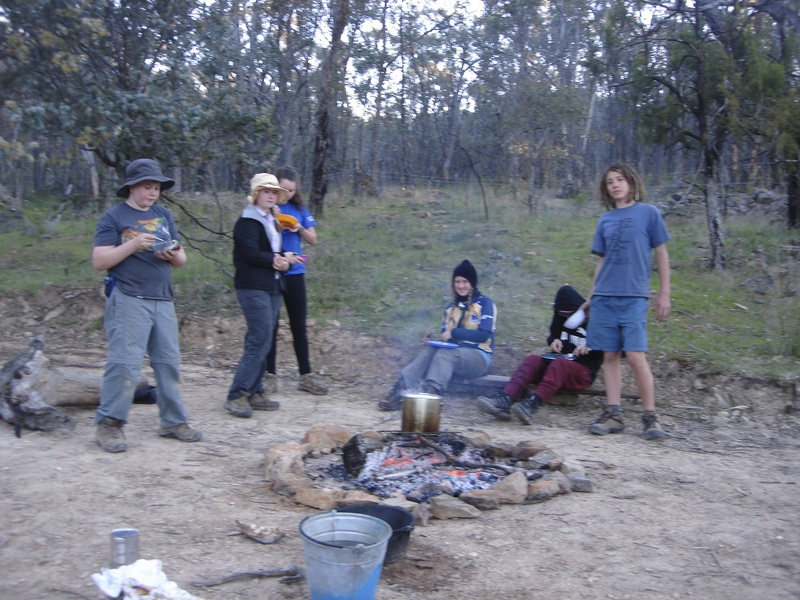 This is a fantastic camp site with a permanent shelter and cooking facilities, though we used the dutch ovens on a campfire on Saturday night to cook a roast beef and veges. 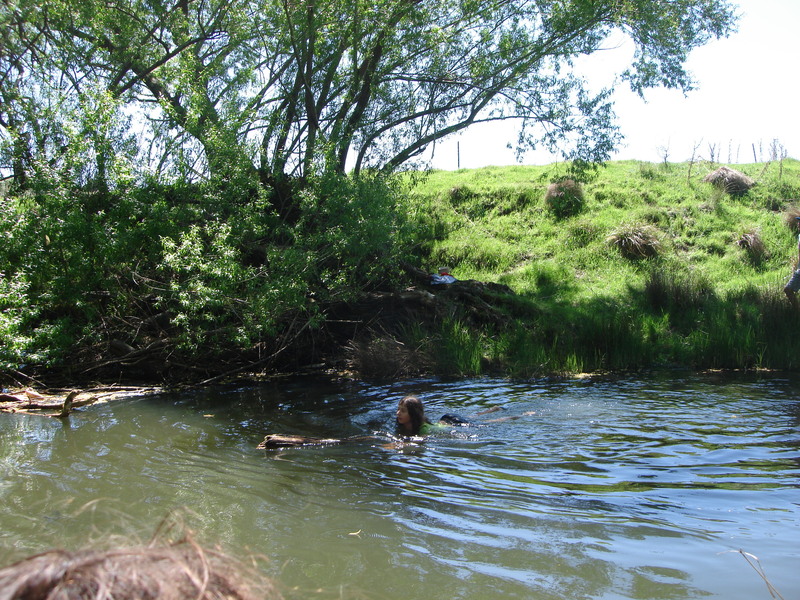 The river running through the property allowed us to fish, though unsuccessfully and encouraged two of the bravest to swim in the chilly water on Sunday afternoon while many others had accidental swims while crossing on makeshift bridges. 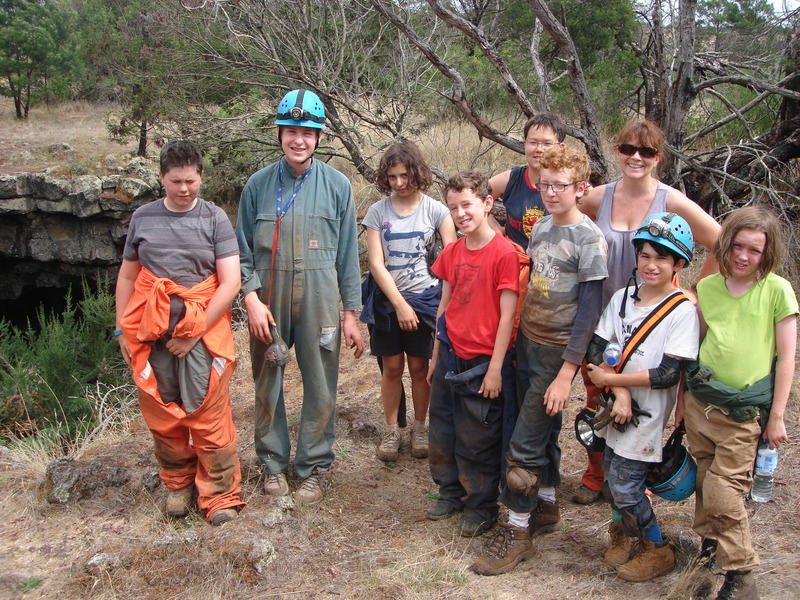 On our hike to the Lauriston Dam we encountered a Shingleback lizard, wallaby remains and a fresh wombat hole. 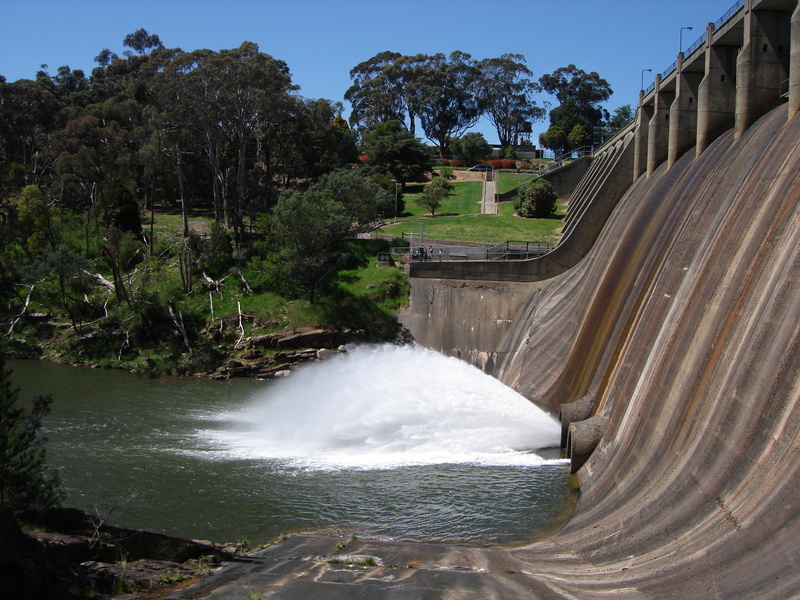 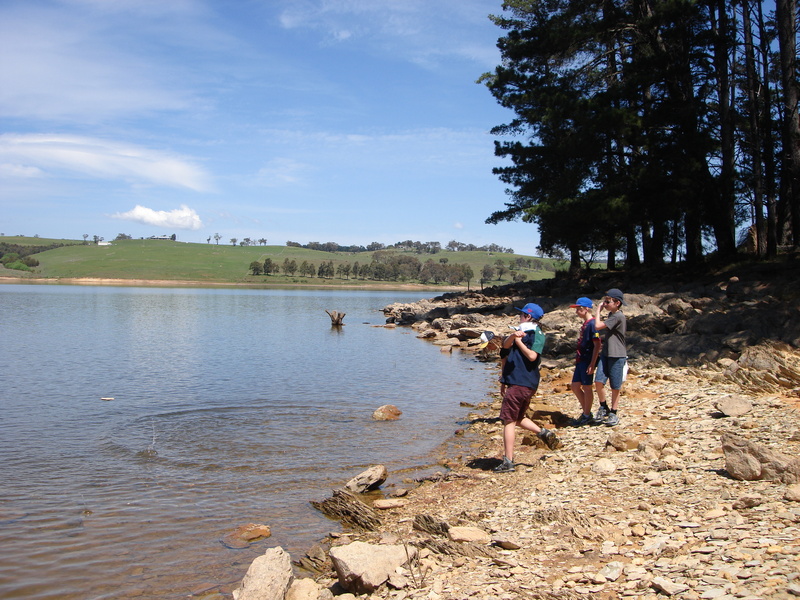 At the dam we spent time in the sun eating lunch, skimming rocks and playing at the waters edge. 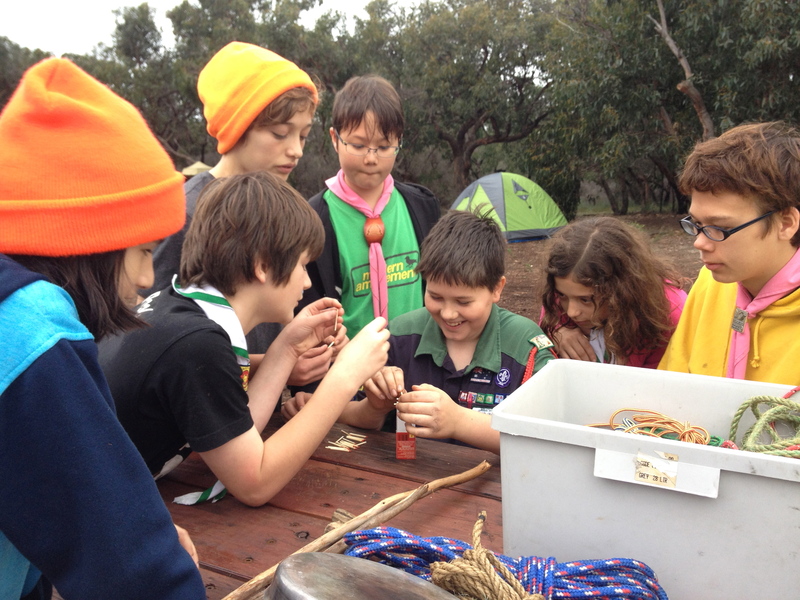 Monash Venturer unit were camping here also and organised a wide game for us and enlightened us in how to play the card game spoons. 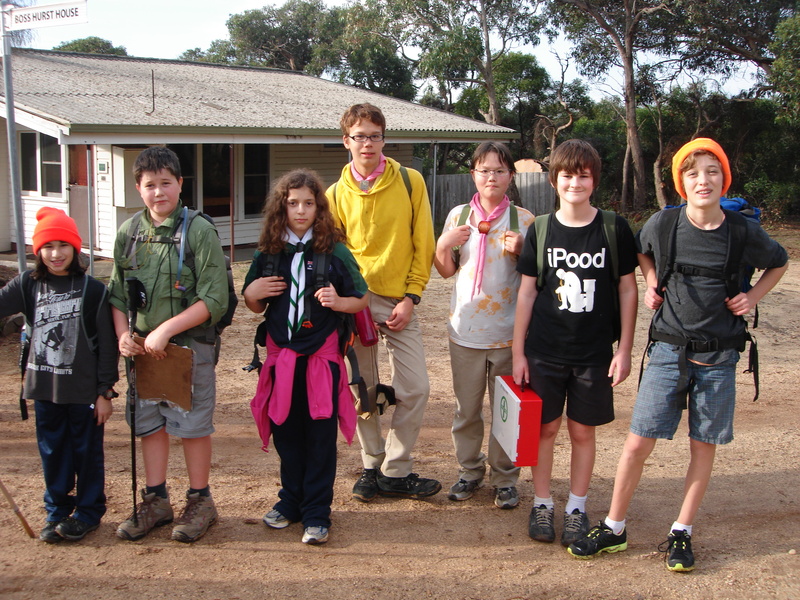 Congratulations Jack C, Jack W, Quinn, Michael and Rudy who camp home in one piece from Survival Camp in Castlemaine. 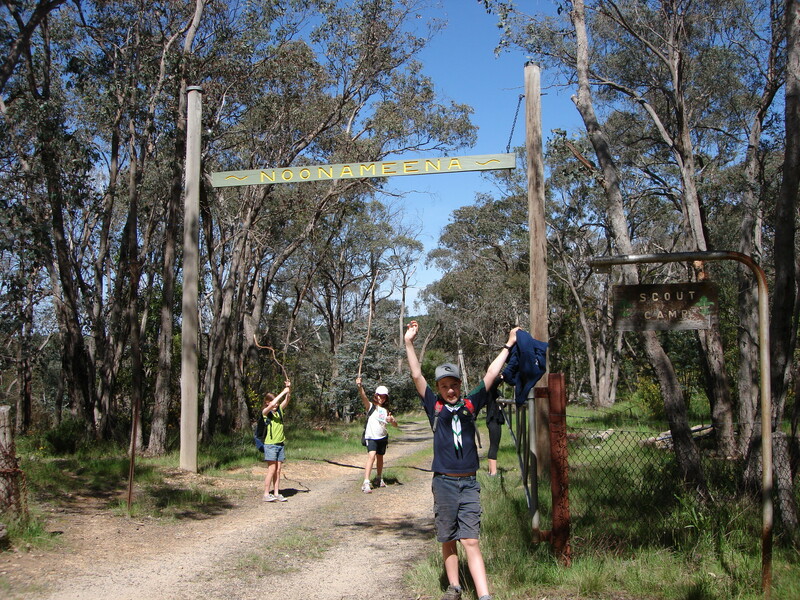 On arrival in Castlemaine the Scouts were given a map and had to use it to navigate their hike into the camp. 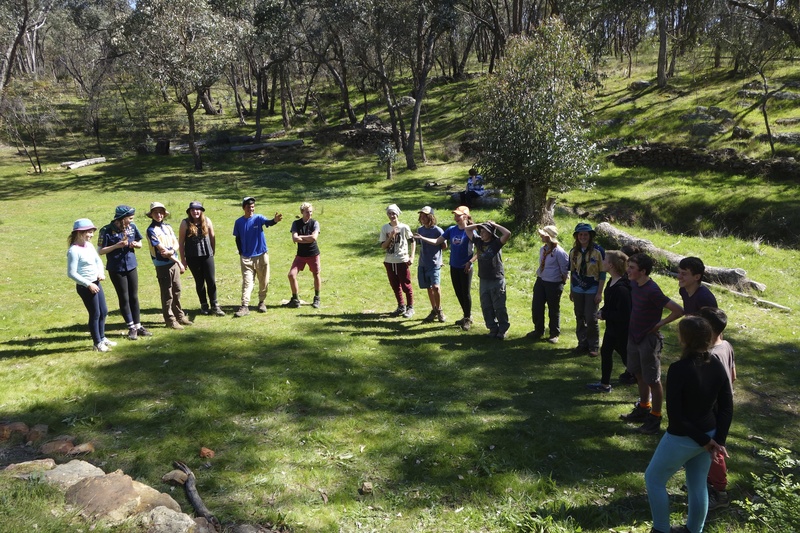 Once there, they chose sites to build shelters from sticks and coffee bush that would keep the weather off them should it turn cold or wet. 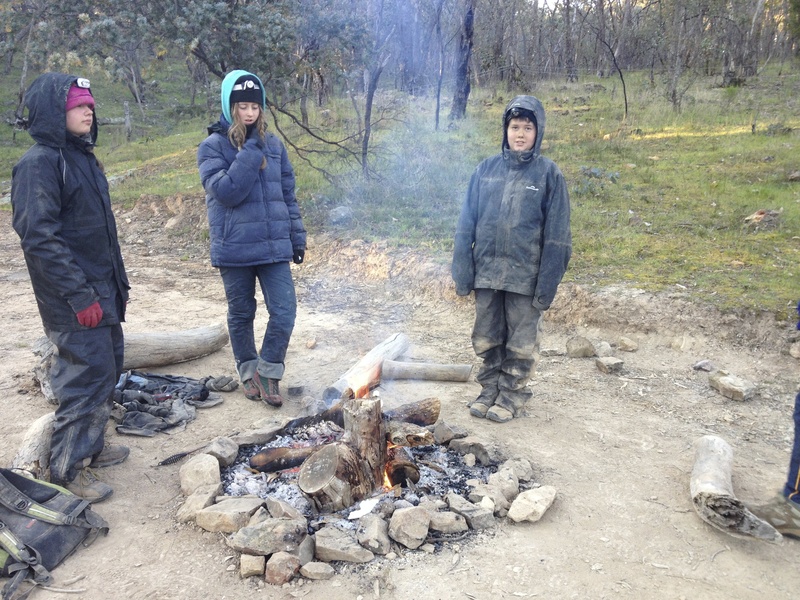 The weather was reasonably kind to them and it didn’t rain but it was cold and dropped to only 1° Celsius overnight. 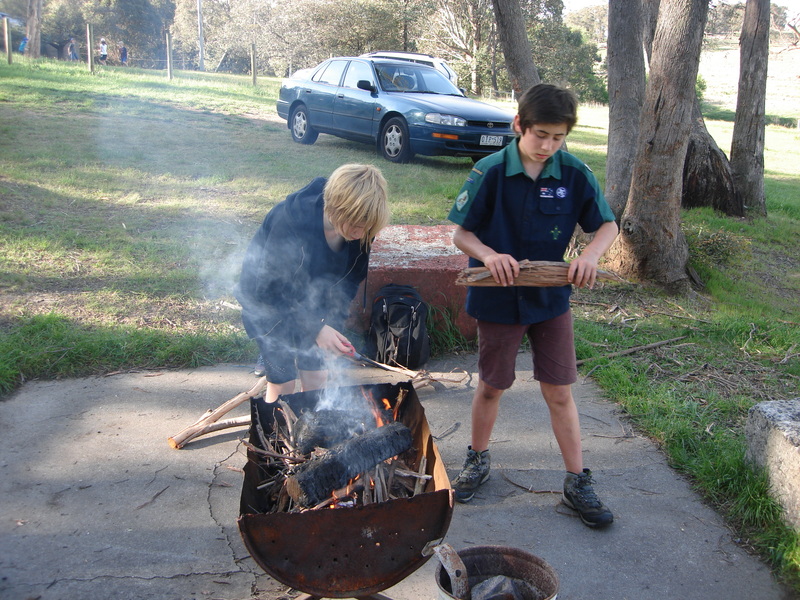 They cooked on an open fire, which they had to keep going 24/7 meaning they had to take turns at night to tend the fire and ensure it didn’t go out. 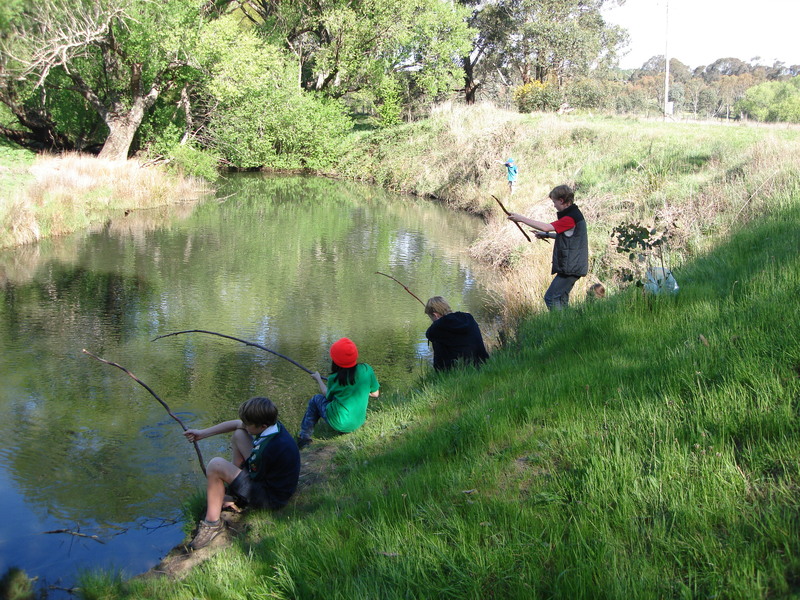 They scavenged for their food by locating hidden skewers in a dry creek bed and using only a billy and dutch oven as cooking aids managed to cook over the weekend a whole Red Snapper, spam stew, sweet potatoes, pumpkin, potatoes, carrots, damper, dumplings, boiled eggs, and tea. 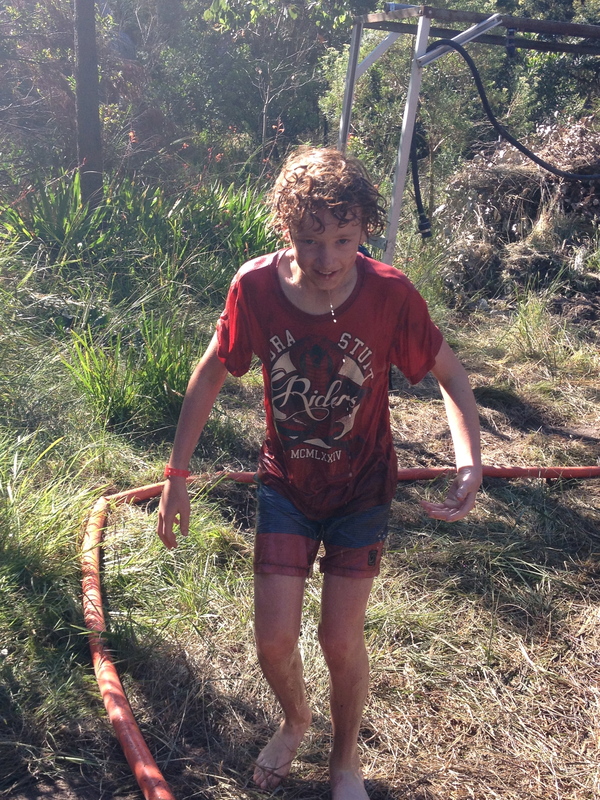 Fun was had and skills learnt in collecting and treating water to drink, mock bush fire and fire fighting exercises and water testing of the bush shelters. 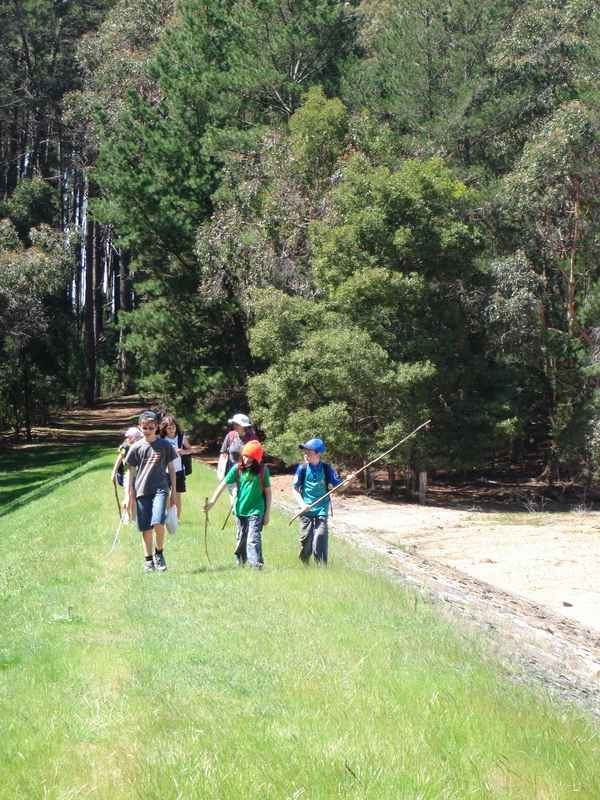 A bush bashing hike on from the ‘Monk’ back to camp enabled them to show great navigation skills and team work as did the air crash first aid scenario where they rescued an injured pilot and carried him to safety on a bush stretcher then ensured their own rescue by using reflective emergency blankets, smoking fires and semaphore. 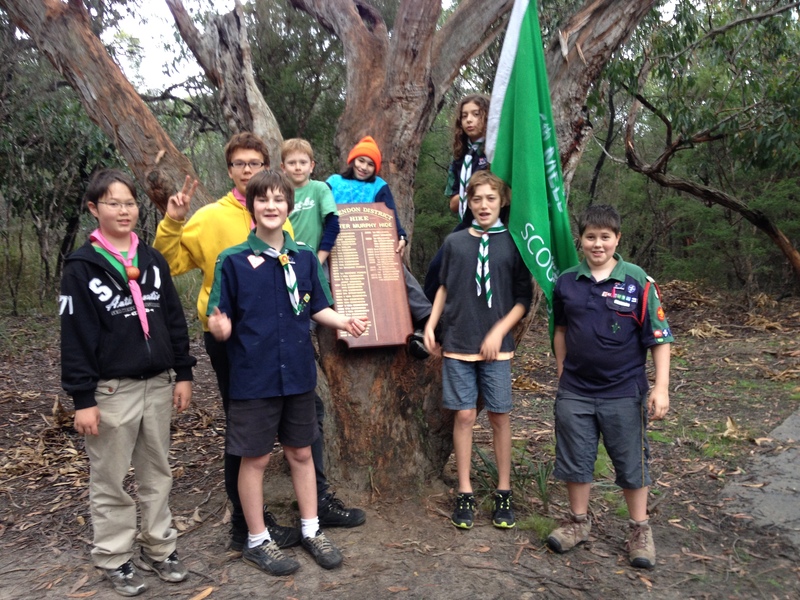 Seven of our Scouts hiked in Eumerella to defend our Walter Murphy Hide Shield over the weekend. 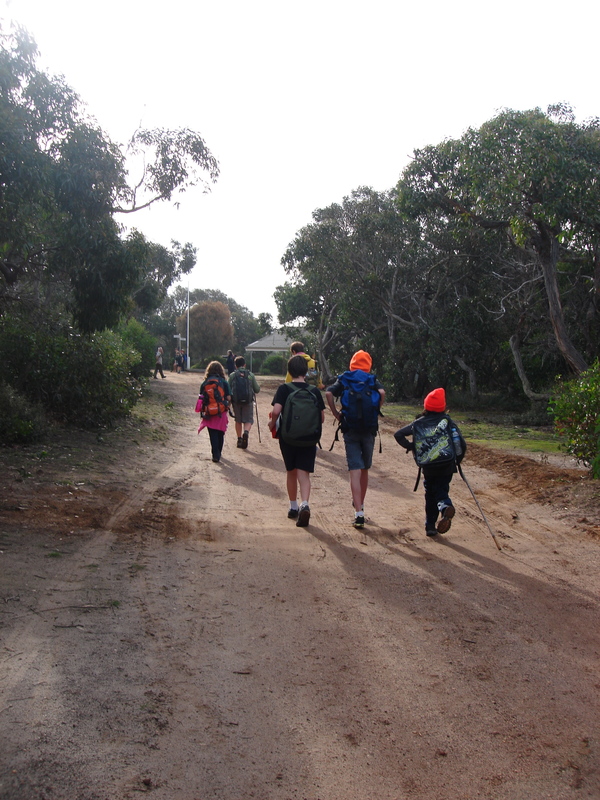 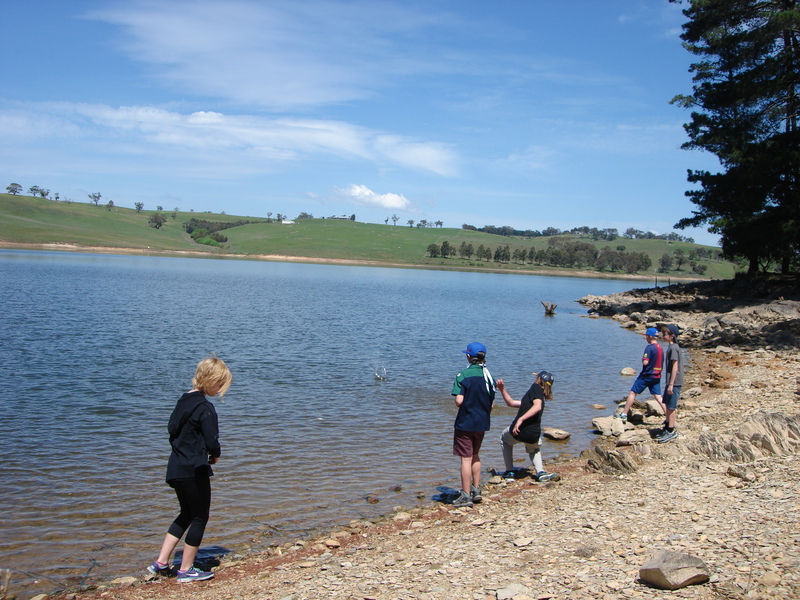 It all started with a pleasant 15km hike from Bells Beach to Eumerella Scout Camp. 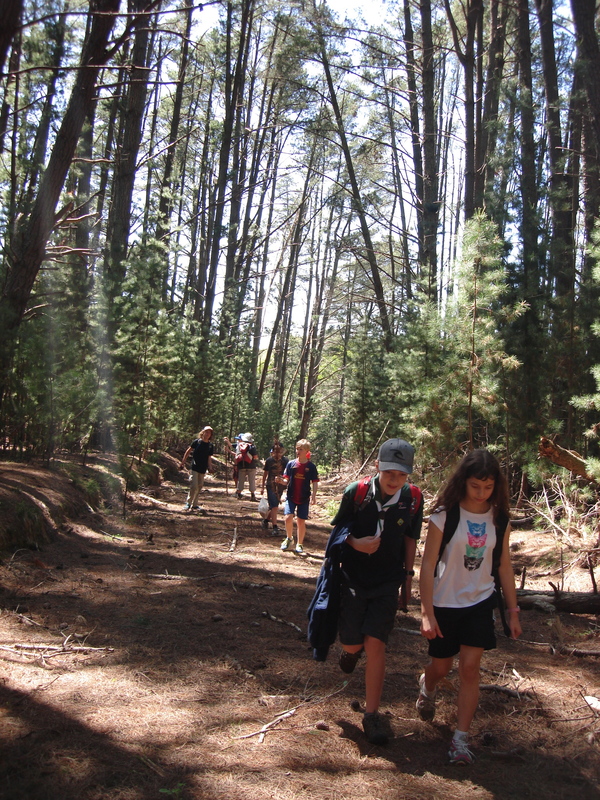 While they crossed the hike finish line last they ranked well on all three bases, first aid, navigation and blind folded tent pitching, kept together as a cohesive group while hiking and encouraged each other to get to the end. 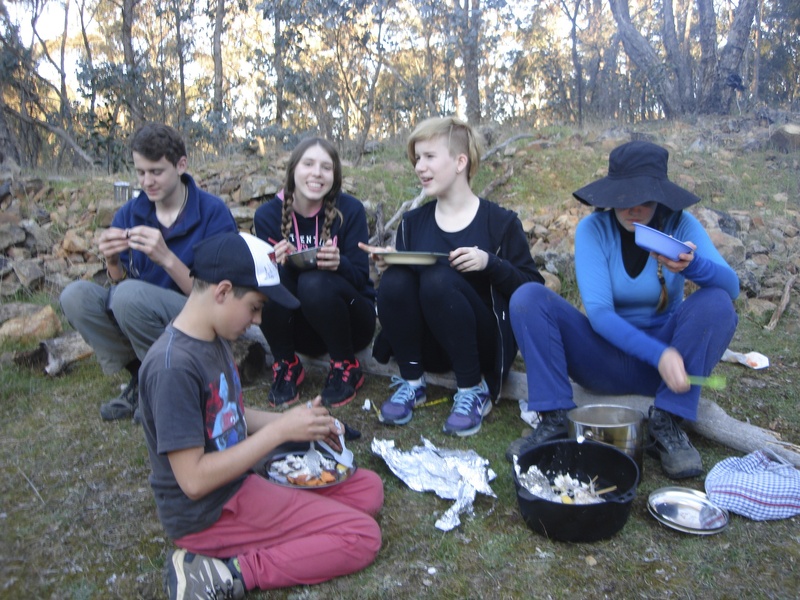 Cooking on trangiers was a first time experience for many of them but they managed to whip up a hot snack after the hike and a good meal before playing a wide game using GPS’. 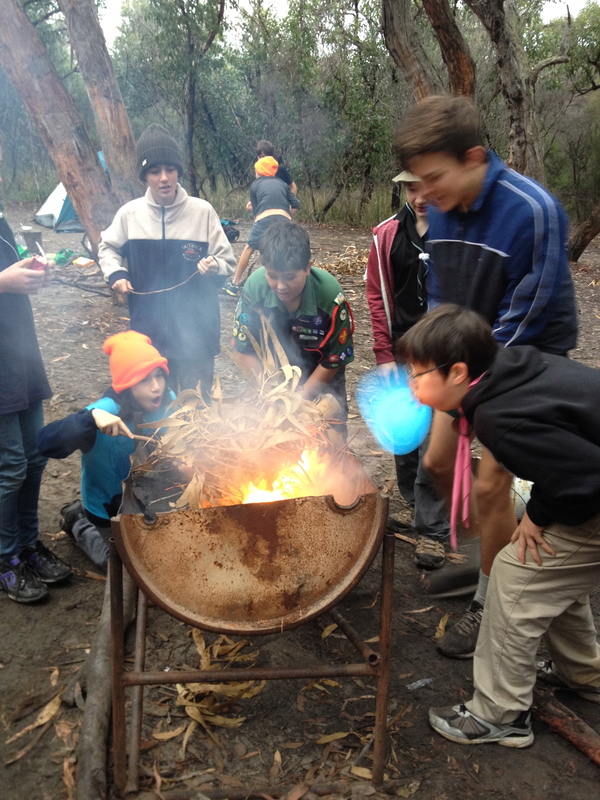 Our group also initiated the campfire getting it gong with a flint and steel, and lots of blowing. 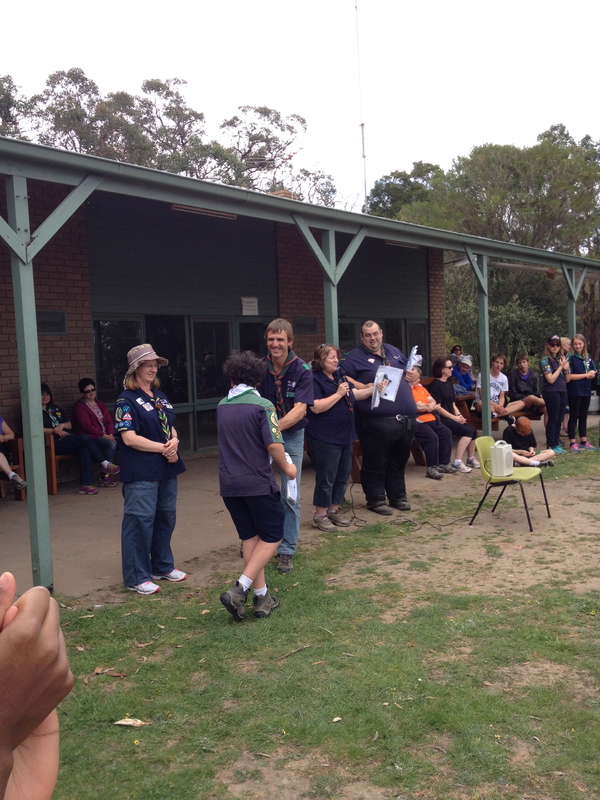 A great rendition and teaching of the ‘I like the Flowers’ song to the group cemented them as skit favourites. 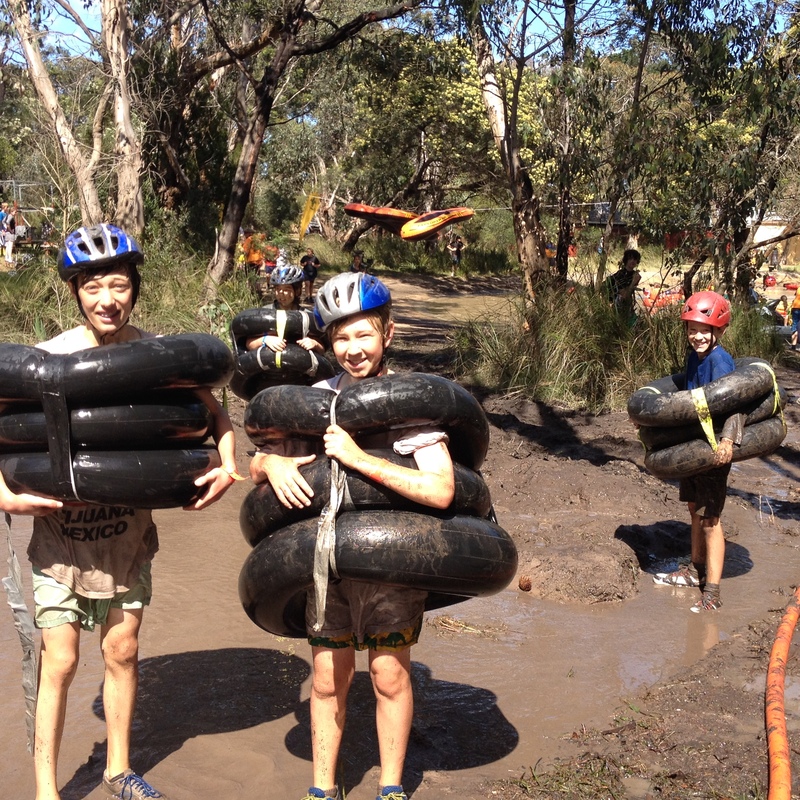 Good placing in several activities on the Sunday helped push them to the front of the pack and to take out the shield. 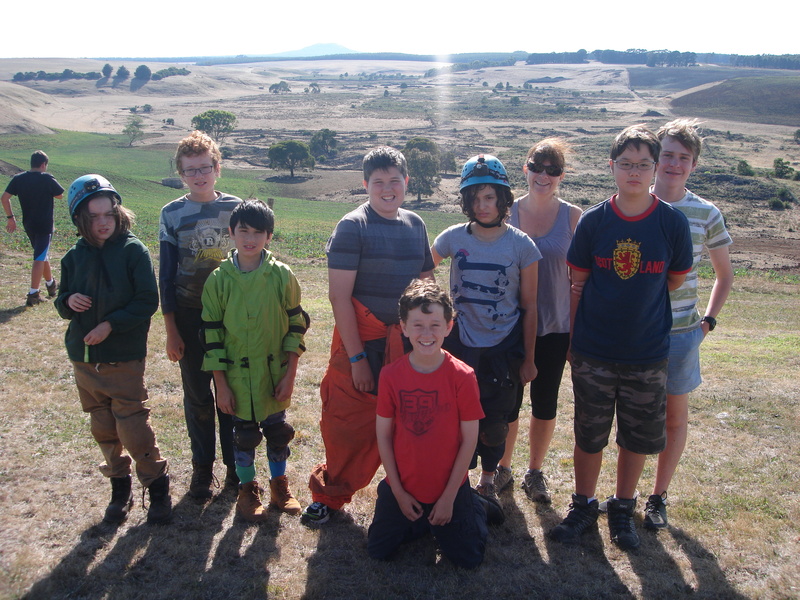 Congratulations Fynn, Henry, Kai, Kenneth, Michael, Sofia and Yo (named Doodley Deedle Dums for the hike) on successfully defending the shield and bringing it back to 6th Melbourne for us for another year.